It's all about the little things in life! A little treat goes a long way to make me smile. After my meeting on Sunday, I popped over to my favorite Starbucks for Crack In A Cup. Well, they call it a "Pumpkin Spice Latte" but I know better. I twitch at the first turn of weather each fall for my drug of choice. I was clean for nearly a full year. But come winter, I will back to square one at CIACA (Crack In A Cup Anonymous). A small price to pay for happiness! haha. crack in a cup. It definitely is! I had my first one EVER yesterday! 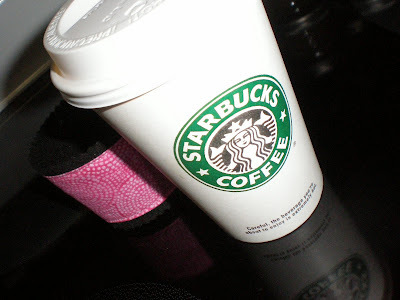 I need to plan to be passing by another Starbucks soon! How cute . 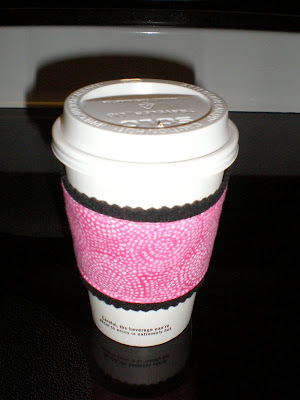 .do you have your own pink sleeve for your Starbucks cup ? Yum! I had one this afternoon! That makes me want to head over to Starbucks right now! you're lucky to have Starbucks. Maybe I should come visit you so I can have a pumpkin latte. I've got to head to etsy and buy one of your coffee sleeves!